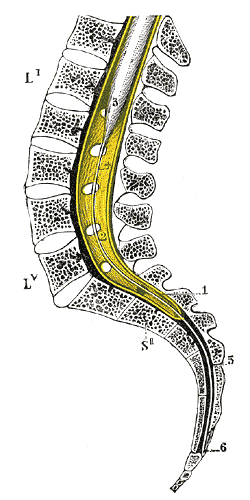 Sagittal section of vertebral canal to show the lower end of the medulla spinalis and the filum terminale. Li, Lv. First and fifth lumbar vertebra. 2. Lower part of subarachnoid cavity. 3. Lower extremity of medulla spinalis. 6. Attachment of filum terminale to first segment of coccyx. The upper part, or filum terminale internum, is about 15 cm long and reaches as far as the lower border of the second sacral vertebra. It is continuous above with the pia mater and contained within a tubular sheath of the dura mater. In addition, it is surrounded by the nerves forming the cauda equina, from which it can be easily recognized by its bluish-white color. The lower part, or filum terminale externum, closely adheres to the dura mater. It extends downward from the apex of the tubular sheath and is attached to the back of the first segment of the coccyx in a structure sometimes referred to as the coccygeal ligament. The most inferior of the spinal nerves, the coccygeal nerve leaves the spinal cord at the level of the conus medullaris, superior to the filum terminale. However, adhering to the outer surface of the filum terminale are a few strands of nerve fibres which probably represent rudimentary second and third coccygeal nerves. Furthermore, the central canal of the spinal cord extends 5 to 6 cm beyond the conus medullaris, downward into the filum terminale. Spinal cord. Spinal membranes and nerve roots.Deep dissection. Posterior view. ^ Susan Standring (7 August 2015). Gray's Anatomy E-Book: The Anatomical Basis of Clinical Practice. Elsevier Health Sciences. p. 762. ISBN 978-0-7020-6851-5. Martini, F. Timmons, M. and Tallitsch, R. Human Anatomy. 5th ed. San Francisco: Pearson/Benjamin Cummings, 2006. Anatomy photo:02:08-0104 at the SUNY Downstate Medical Center - "Vertebral Canal and Spinal Cord: Regions of the Spinal Cord"
"Anatomy diagram: 03281.000-1". Roche Lexicon - illustrated navigator. Elsevier. Archived from the original on 2014-01-01. This page was last edited on 27 November 2018, at 04:14 (UTC).